DX Scholars enjoy opportunities to network with leaders in journalism and film. 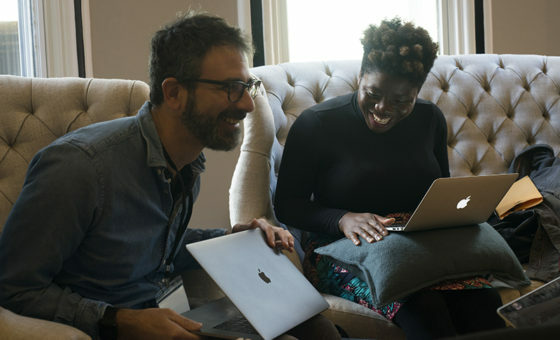 Pictured here are Ivan Sigal, executive director of Global Voices and Opeyemi Olukemi, executive producer and vice president of POV's Digital Production and Innovation team. 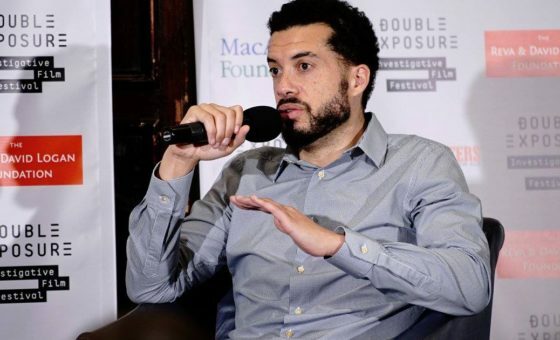 Academy Award winning director Ezra Edelman speaking at DX2016 about his documentary, O.J. : MADE IN AMERICA. We are pleased to offer modest scholarships to journalists and filmmakers who wish to attend Double Exposure, but lack the means to do so. Assistance is contributes to the registration, travel, and/or hospitality of journalists in print and other media, as well as filmmakers whose work takes them into investigative territory. Scholarship recipients have demonstrated a financial need and a proven track record of professional engagement in the field. Scholarship are available thanks to the generosity of the Ford Foundation, the Reva and David Logan Foundation and the Democracy Fund, and in partnership with Firelight Media, Brown Girls Doc Mafia, and MIT Open Documentary Lab.